An array is a group (or collection) of same data types. For example an int array holds the elements of int types while a float array holds the elements of float types. Why we need Array in C Programming? Consider a scenario where you need to find out the average of 100 integer numbers entered by user. In C, you have two ways to do this: 1) Define 100 variables with int data type and then perform 100 scanf() operations to store the entered values in the variables and then at last calculate the average of them. 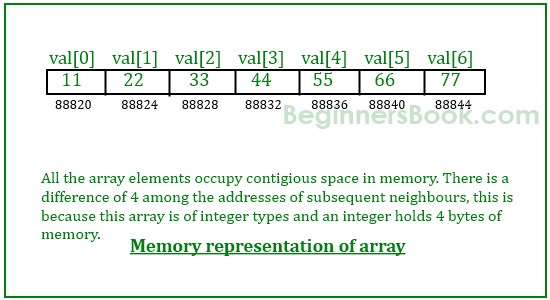 2) Have a single integer array to store all the values, loop the array to store all the entered values in array and later calculate the average. Which solution is better according to you? Obviously the second solution, it is convenient to store same data types in one single variable and later access them using array index (we will discuss that later in this tutorial). Similarly an array can be of any data type such as double, float, short etc. You can use array subscript (or index) to access any element stored in array. Subscript starts with 0, which means arr represents the first element in the array arr. In general arr[n-1] can be used to access nth element of an array. where n is any integer number. Here we are iterating the array from 0 to 3 because the size of the array is 4. Inside the loop we are displaying a message to the user to enter the values. All the input values are stored in the corresponding array elements using scanf function. Suppose, if we want to display the elements of the array then we can use the for loop in C like this. Un-initialized array always contain garbage values. 2D array – We can have multidimensional arrays in C like 2D and 3D array. However the most popular and frequently used array is 2D – two dimensional array. In this post you will learn how to declare, read and write data in 2D array along with various other features of it. Passing an array to a function– Generally we pass values and variables while calling a function, likewise we can also pass arrays to a function. You can pass array’s element as well as whole array (by just specifying the array name, which works as a pointer) to a function. Pointer to array – Array elements can be accessed and manipulated using pointers in C. Using pointers you can easily handle array. You can have access of all the elements of an array just by assigning the array’s base address to pointer variable. need help!i want to define a structure named student containing the fields “name” and “CA”,then declare an array of structure having 50 elements of student type.Using the array i would then like to display the name and CA of student number 11…..HELP! You can declare the range of array after scanf function. You can use string to store name. For that you have to declare the array in char data type. I really like the lucid language you use and the flow of teaching is awesome. Thank you for creating this website. I appreciate your teaching so much. Thanks for the info.